We are very proud of our superb orangeries available to homes in Fleet, Hampshire, Farnham, Camberley, Aldershot, Surrey, Basingstoke, Hook, Farnborough, Bagshot, parts of Berkshire, Lightwater, Cove, Frimley, Yateley and surrounding areas. These exceptional orangeries create a practical room that looks beautiful and will truly enhance your lifestyle, providing a year round accessible space. When you are looking for a stylish, yet practical home improvement in Fleet, Hampshire, Farnham, Camberley, Aldershot, Basingstoke, Hook, Farnborough, Bagshot, Lightwater, Cove, Frimley and Yateley, then our orangeries from Ultraframe are ideal. They will provide you with additional living space that you can use no matter what time of year it is. They offer a beautiful, classy room to any property, adding value and giving you many years of pleasure. Much like a conservatory, the orangery has a lot of glass area in its construction, however, it is also a cross with a traditional extension, so the glass is supported by more brickwork than would be seen in a conservatory design. This means that you get the benefit of superb sound proofing, additional privacy and all the other features that are associated with extensions. Not all orangeries look the same! Your orangery will be designed to be unique to your home, maximising the potential of the space you have available. This ensures that although there are a variety of designs you can choose from for inspiration, the final version will be specifically tailored to you and your property. Our orangeries are constructed using the very latest materials, that have been engineered to offer outstanding thermal qualities and energy efficiency. 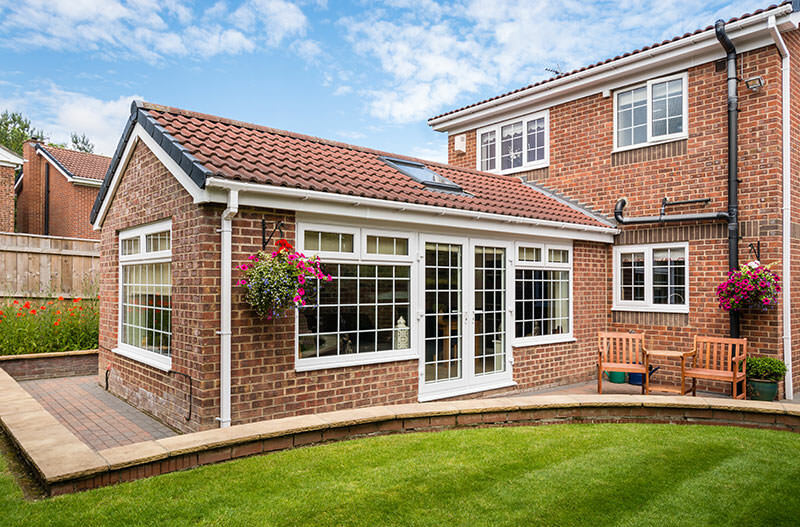 Your orangery will be warm in the winter and cool in the summer, meaning that not only will it help keep your home comfortable, but also, you can use it all year round. One of the greatest benefits of our orangeries is their practical prices. Where an extension can often become a costly and time consuming exercise, the orangery, despite having many of the benefits of an extension, comes in at a much lower price. In fact, it is not much different to the cost of a traditional conservatory! Our teams are family to us, so we ensure they are highly trained and incredibly motivated, so whether they are in customer services or installations, they will strive for the very best at all times. All our staff take pride in their work and will never leave a job without it meeting the most incredible standards. The biggest benefit of course, is that an orangery is less time consuming and less challenging to install when compared to an extension. Our Ultraframe orangeries are constructed using high specification materials and designs, so that your orangery is the perfect fit and will provide you with a pleasurable space for many years. Why not take a look at our online quote calculator and get a free orangery quote. You can enter your specifications and our clever calculator will provide you with a tailored price for your unique orangery in Fleet, Hampshire, Farnham, Camberley, Aldershot, Basingstoke, Hook, Farnborough, Bagshot, Lightwater, Cove, Frimley and Yateley. Or, feel free to contact us and we will happily advise you on the options available, helping you to make a fully informed orangery choice.